Fianna Fáil Senator Mark Daly has demanded greater resources for the local ambulance service in Kerry following a series of alarming delays in the response time to local emergencies. The Dáil is this week debating a Fianna Fáil motion which raises concerns about a growing crisis in the ambulance service. 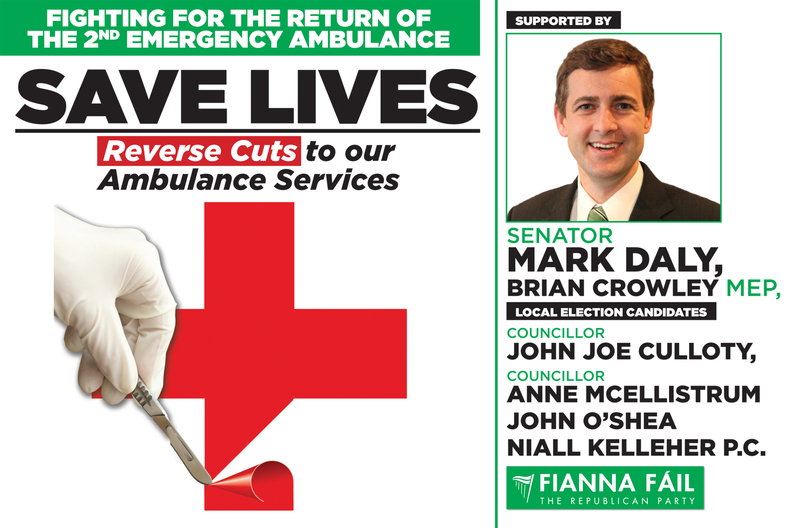 “The Government is completely ignoring the crisis in our local ambulance service,” said Senator Daly. “Official figures show that last year, only one in every three people with life-threatening conditions were responded to within the target time. In the last fortnight I was made aware of a situation whereby it took an ambulance almost 45 minutes to reach a woman who had fallen seriously ill in Headford. The recommended response time for a life-threatening incident is 19 minutes. These delays are unacceptable and could cost lives. “The centralisation of ambulance control and dispatch has led to serious inconsistencies in ambulance cover and a lack of local knowledge when it comes to responding to emergencies. In Kerry alone, there have been cases where ambulances were sent to Lispole instead of Listowel, and to Cloghane in West Kerry instead of Clahane in Ballyduff’. Local ambulances are also often sent to another county for emergencies, leaving significant areas in this region without any cover whatsoever. It’s an extremely dangerous situation. “The bottom line is that the ambulance service is not getting the support and resources it needs to run an efficient and safe service nationwide. Despite the selfless dedication of our local paramedics and the high quality of care they provide, they are being undermined by mismanagement of the service at a national level. “In addition to this, the service is not adequately resourced. The Republic of Ireland has less than 1,600 ambulance staff and a budget of €137million to cover a population of 4.6 million. Compare that to Scotland which has three times as many ambulance staff and just under twice the budget that we have here. “This week in the Dáil, Fianna Fáil is asking TDs from all parties to stand up for our local ambulance service and ensure that it gets the basic resources it needs to respond safely to emergencies. People have a right to expect that they will receive a safe and timely response in the event of life-threatening emergencies,” said Senator Daly.